This exercise requires the crew to accomplish its task within three minutes. To convert the M966 weapon system from the TOW 2 mode to the MK 19 mode and put the TOW 2 into its stowed position, the crew performs the following actions. (1) Disconnects the J-1 cable from the MGS, coils the cable and stows in the traversing unit. (2) Disconnects the battery power conditioner cable from the MGS battery power cable, and winds it on the stowage handle. (3) Disconnects the MGS battery cable, recovers the MGS cover, stows the cable in the MGS, replaces the cover on the MGS, and straps the MGS down. (4) Disconnects the nightsight power cable from the TVPC, and winds and stows the cable. (5) Receives the nightsight case from the gunner and stows it in the vehicle. (6) Gives the gunner the gun cradle/ammo bracket, T&E mechanism, and empty case catch bag assembly. (1) Arms the missile (if armed), unlocks the bridge clamp, removes the missile and hands it to the driver. (2) Disconnects the TVPC power cable from the night sight and drops down the hatch. (3) Disconnects the nightsight and places it in the case, and hands the case to the squad leader. (4) Disconnects the optical sight and hands it to the driver. (5) Disconnects the launch tube, and hands it to driver. (6) Unclasps the traversing unit, lifts the traversing unit out of the pedestal mount, and takes it through the gunners hatch. 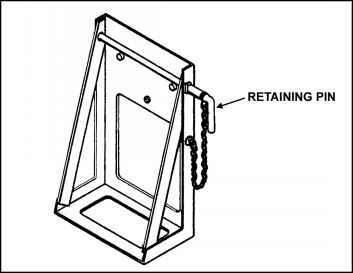 (7) Secures it to the TU stowage base, and closes the pedestal mount access cover. (8) Takes the gun cradle/ammo bracket and T&E mechanism from the squad leader. (9) Installs the cradle/ammo bracket on the heavy interdiction missile system (HIMS) mount. (10) Ensures the T&E mechanism is zeroed, installs the T&E mechanism to the gun cradle and the pedestal mount on the HIMS. (11) Takes the MK 19 from the driver and installs it on the gun cradle. (12) He installs the empty case catch bag assembly on the gun cradle. (13) Receives ammunition can from the driver, while ensuring that the ogive ends are pointing down range, and loads the MK 19. (1) Dismounts the vehicle and enters the right rear passenger door, and unlocks and opens the cargo hatch. (2) Takes the missile from the gunner and stows it in the missile rack. (3) Unstraps the nightsight case and gives it to the gunner. (4) Takes the optical sight from the gunner and stows it in the vehicle. (5) Takes the launch tube from the gunner and stows it in the vehicle. (6) Unstraps the MK 19 from its stowage, and gives it to the gunner. (7) Unstraps one can of ammunition and places it on top of the vehicle near the gunner. (8) Replaces the forward handling ring and dust cover on the missile. (9) Ensures that every item in the cargo hatch is secure and closes the cargo hatch. (10) Exits the vehicle through the right rear passenger door and takes his place as the driver.